Governor John Hickenlooper’s $100 million, four-year commitment to biking and walking represents just 2.5 percent of the state’s transportation budget, but it promises to make a big difference for cities and towns throughout Colorado. Not surprisingly, however, the idea of using transportation resources to improve street safety, help people get more physical activity, and make more efficient use of scarce road space is beyond some of the state’s elected officials. 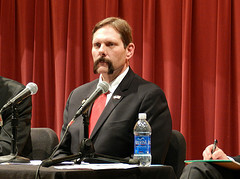 Count State Senator Randy Baumgardner among the haters. Baumgardner is a rancher who represents a rural chunk of western Colorado, and he’s also the chair of the Senate Transportation Committee. I think bicycling is wonderful, but I think we need to prioritize our transportation issues. All I’ve heard is we need to fix our roads and bridges. I’d like to see that addressed, and if there’s excess assets, then by all means let’s put it into other forms of transit. Baumgardner’s statement came during an interview with Hickenlooper’s bike czar, Ken Gart, who helped fashion the $100 million public-private investment, called the Colorado Pedals Project. Heffel asked him if Baumgardner’s stance was valid. No. You can do a heck of a lot for bikes and pedestrians with very little money — paint can have a big impact. One of the programs that the governor announced is Safe Routes to School. Safe Routes is a matter of painting crosswalks and doing small things like that that can have a big impact. It’s where Bicycle Colorado is out teaching the kids how to bike safely, helmet use, navigating the roads. And that program will be expanded. I would also point out that giving people better options to walk and bike is a low-cost way to extend the life of roads, since it helps people drive fewer miles and exert less wear-and-tear on infrastructure. Colorado’s roads and bridges are going to last longer if people aren’t forced to make every trip in a car. From his perch, Baumgardner can influence transportation legislation and spending, but the funds for Colorado Pedals are outside his jurisdiction. That’s because Hickenlooper has set it up in a way that doesn’t cut into state road funding — which makes Baumgardner’s opposition all the more absurd. The additional bike funding mainly comes to Colorado DOT from the federal government and state lottery funds.